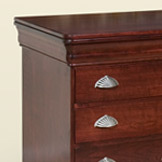 The Le Chateau increases the size of cabinet 1.5 inch width and .75 depth. We offer 7 standard paint colors. 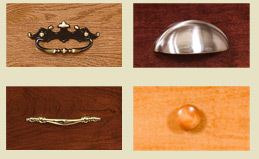 Inquire about our custom matching. We offer 9 standard stains. Inquire about our custom matching. 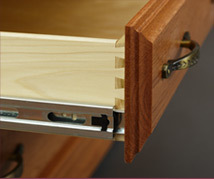 Dovetailed drawers are standard on all our drawers in our cabintets. 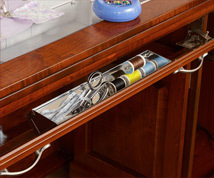 Full extension drawer slides are also standard on our cabinets, allowing full use of drawer space. The air lift is a 3-position lift in preset locations. Lowered, your machine is completely enclosed. In mid-position the work are is level. In the top position the machine is completely exposed. The electric lift allows you to raise and lower your machine with ease. You can position it at any height comfortable for your work. 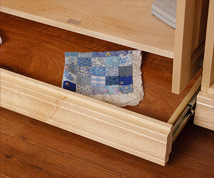 Tip-out tray is an optional tray above the knee-hole and is a convenient space to add your frequently used sewing accessories. 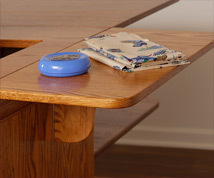 The optional support top is an additional panel of wood designed to provide a support to the wings. 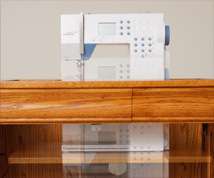 This feature is especially popular with larger sewing cabinet models. The optional side-wing adds extra table top space out the right-hand side. The backsplash is an additional moulding across the back of your cabinet. When the cabint is open the backsplash servers as a support. 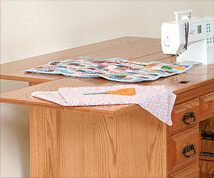 The Quilter’s Table is an additional table top workspace out the back of the cabinet. It can fold down when not in use. 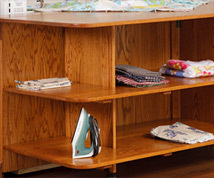 The back shelf kit is an additional shelving option for the quilter’s table. 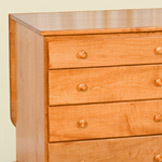 Slamming drawers is hard on furniture. 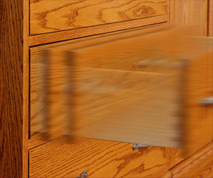 The soft close allows the drawer to close normally until the last inch. 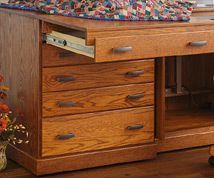 A mechanism causes the drawer to slowly close the last inch. 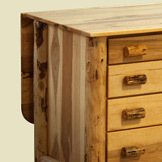 Distressed finish gives your furniture a personailty all it’s own. 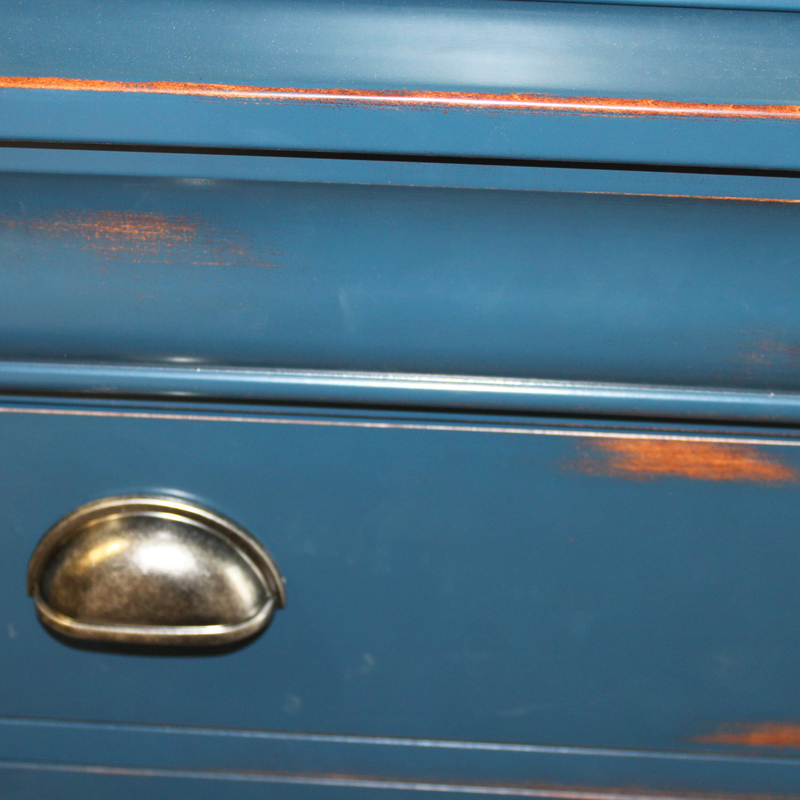 After finishing we rub the edges and apply random distress marks to give the distressed look. 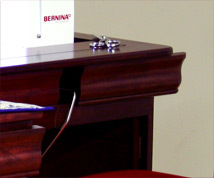 The optional sliding front accomodates the knee bar on various Bernina machines. 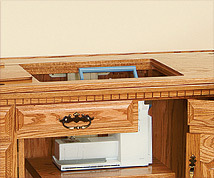 We offer additional height feature for our cabinets. 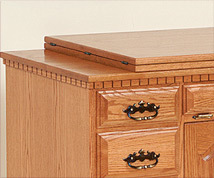 We offer two additional height configurations, 33.5” and 35”. 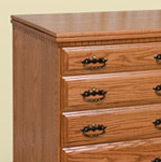 The additional height adds a drawer. Some additional features are only available with this upgrade. 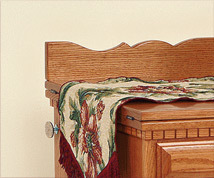 The pocket door feature is only available on the upgraded height models. 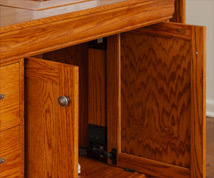 It allows your doors to be slid in the sides of the knee-hole.